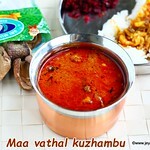 Maa vathal kuzhambu is a tamarind based south Indian gravy recipe,uses dried mango vathal in the gravy. I have seen this many times in Indian shops here but never tried in cooking. Recently when i saw this pack of Maa Vathal in Sri Murugan stores Singapore,i picked a pack of it. But i am not sure,how to use it. When i googled,some of them soak this and used it in the kuzhambu and some just added as a vathal in the kuzhambu. Later a friend of mine shared her mother in law's version of Maa vathal kuzhambu,they call it as maa vathal poondu kuzhambu. It turned out well and i liked the taste of the maa vathal after it got soaked in the gravy. Udhayam Brand Maa vathal is available in Sri Murugan stores Singapore. They have outlets in Syed Alwi road and the new Sri Murugan plus opened in Simei also have a wide variety of groceries and fresh vegetables. The Maa Vathal comes in a 100 gm pack and the price is around 2 SGD. You can download Sri Murugan Mobile app (both android and iOs version) and get your grocery by home delivery. 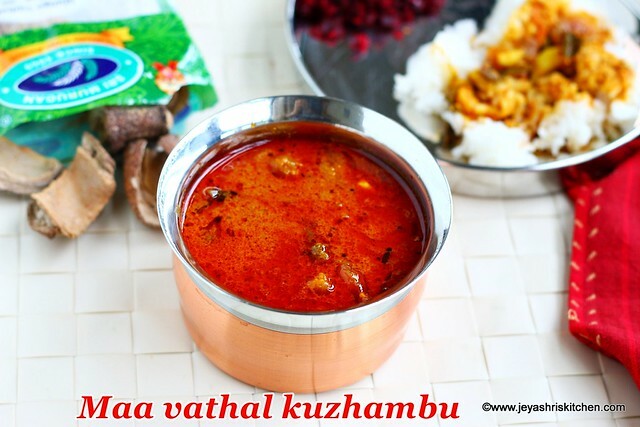 Maa vathal kuzhambu is a tamarind based south Indian gravy recipe,uses dried mango vathal in the gravy..
*Generally the maa vathal has salt in this,so add salt a little bit or check and add salt to avoid salty kuzhambu. Soak tamarind in hot water for 10 mins. Extract tamarind water using 1 and 1/2 cups water. In a pan add the sesame oil and add the mustard seeds and methi seeds. Once it splutters add the Small onions and garlic pods. Saute till it starts shrinking. Now add the maa vathal. I added 2 big pieces of maa vathal,you can add one more also. For my friends in Singapore, we get maa vathal in Sri Murugan stores. Add the red chili powder and sambar powder. Give it a quick mix and immediately add the tamarind extract. Add the turmeric powder,curry leaves and salt. As maa vathal has salt in it,do not add salt in usual quantity. Add very little and then check for salt once the gravy is done. If needed,add little later. Grind 2 tblsp of coconut into a fine paste. Let the gravy boil till the right consistency of the kuzhambu is reached. Switch off the flame and smear 1 tsp of sesame oil. Maa vathal kuzhambu is ready to serve. 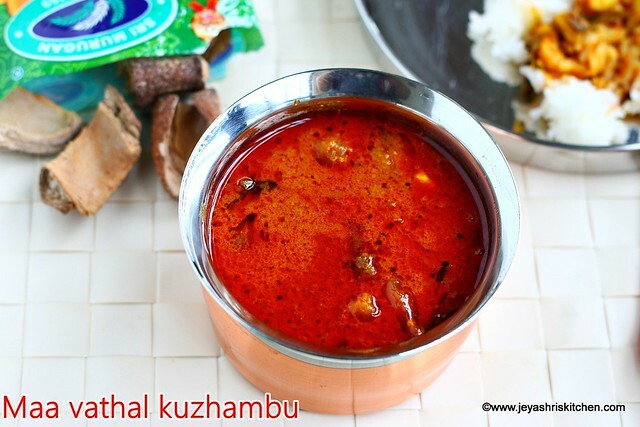 You can serve this kuzhambu with plain rice and any curry of your choice. This kuzhambu tastes great the next day. Add the turmeric powder,curry leaves,jaggery and salt. You can grind one tomato and add it to the gravy after adding the tamarind extract. Adding coconut balances the sourness and the spiciness of the gravy. You can grind 1/2 tsp of fennel seeds to the coconut. You can skip the tamarind and add finely chopped tomatoes to the maa vathal kuzhambu.